The architecture of ancient Rome developed over the course of several centuries and reached at its zenith during the era of Pax Romana or ‘Roman Peace’. It took inspiration from ancient Greek architecture and incorporated various aspects in it such as arches and domes. Other than constructing grand monuments, Roman architecture also resulted in significant developments in housing and public hygiene. It inspired various new forms of architecture during the medieval period and continues to inspire modern architects today, particularly in the western world. The history of ancient Roman architecture starts with the establishment of the Roman Republic in 500BC and goes up to the 4th century AD. Various techniques crucial to later Roman structures were taken over from the Etruscan neighbours. This included such techniques as hydraulics and the construction of arches. Further, direct and indirect influence of the Greek architecture also played a role in the development of Roman architecture. As a matter of fact, Romans extensively employed Greek craftsmen and Greek engineers for the construction of various famed Roman buildings. Common themes with Roman architecture permeated through their buildings like this example. 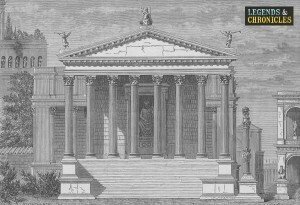 The actual revolutionary phase in ancient Roman architecture came about when Romans started making extensive use of the previously little known techniques of arch, vault, and dome. These architectural forms were extensively used in a variety of civil engineering projects as well as public buildings and military facilities. The foremost example of this architecture was the Roman Pantheon which remained the largest dome in the world for more than a thousand years and continues to be the largest unreinforced solid concrete dome to this day. Other architectural innovations during this architectural revolution included lintel arch, independent corbel, and the metal-tie. As we mentioned earlier in this article the Romans made use of various building techniques in their architecture such as the use of the arch and the vault. While much of this was inspired from the ancient Greek architecture, the Romans considerably developed it with their own forms of structural engineering. This included various new vaulting techniques with geometric shapes such as semicircular barrel vault, the groin vault, and the segmental vault. Use of stucco and tiles was made to cover the vault surfaces. The prime examples of the successful use of these techniques in ancient Roman architecture are the Basilica of Constantine and Maxentius in Rome. During the initial stages of ancient Roman architecture, marble was used as the primary building material but soon this was replaced by tile covered concrete which resulted in an increased architectural variety. This included broad arches supported by great pillars and domes instead of dense lines of columns suspending flat architraves. The marble used before concrete was mainly reserved for decorative purposes and the actual construction materials included travertine which was a form of limestone quarried in Tivoli. Roman concrete was the primary construction material used during the later stages of Roman Republic and throughout the Roman Empire. It had many properties similar to modern Portland cement and was based on hydraulic-setting cement. Various complicated and innovative structural forms were developed with this concrete during the Roman Concrete Revolution. Other than the buildings, this concrete was also used in the construction of roads. Roman developed concrete consisted of a mixture of lime mortar, water, sand, and pozzolana. Various materials peculiar to Romans such as horse hair to make concrete less prone to cracking and animal blood to increase resistance to frost were also used. Fired clay bricks were used in ancient Roman architecture and these bricks, through Roman legions and their mobile kilns, were introduced in the far flung areas of the empire. The Roman brick was made in various different sizes and shapes including square, triangular, rectangular, and round shapes. The most common size of these Roman bricks was 1.5 Roman feet by 1 Roman feet. Various variations up to 15 inches were found in this size. By the initial years of the empire, Romans had mastered the art of brick making and made extensive use of bricks in public and private construction. A wide range of public construction projects of ancient Roman architecture survived for centuries, some of them to the modern times. These construction projects are a living testimony to the architectural prowess of the Romans. Some of the prime examples of ancient Roman architecture include The Roman Pantheon, The Colosseum, Circus Maximus, Tower of Hercules, Baths of Diocletian, Verona Arena, and others. 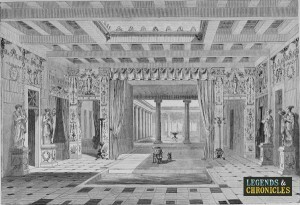 An illustration of the inside of a Roman domus. Ancient Romans used proper city planning and made use of regular orthogonal structure for the modelling of their colonies. In this too, they were inspired by ancient Greeks and the planned cities of the Etruscans. The important components of the city planning of Romans consisted of central forum with city services, surrounding rectilinear grid of streets, and a surrounding wall for defence. The square grid was crossed by two diagonal streets to reduce the travel time. Remains of some of the cities constructed by Romans survive to this day, and it’s obvious that the Romans were methodical and thorough when it came to planning how and when to implement certain structural design choices. Romans built hundreds of amphitheatres all over the Empire and this was one of the most distinguishing characteristics of the ancient Roman civilisation. The amphitheatres were usually oval in shape and were different from the ordinary semicircular theatres. The most popular of ancient Roman amphitheatres was easily the Roman Colosseum which was also the largest amphitheatre in the Roman world. It was built by the emperors of the Flavian Dynasty and completed in 80 AD. Other famous Roman amphitheatres include the amphitheatre of El Djem, the Verona Arena, the Paula Arena, the Pompeii Spectacula, and others. Ancient Roman architecture was in part inspired by the ancient Greek and Etruscan architectures but made very important and unique developments over the course of several centuries. It had its turning point with the Roman concrete revolution when extensive use of concrete began in Roman construction projects. The ancient Roman architecture resulted in some of the most magnificent and durable monuments in history including various amphitheatres, columns, public baths, and other buildings. The Romans also took care of proper planning and design while founding new cities throughout their empire, leaving something behind that would inspire future generations and civilisations.